Several stick out from the discussion, communication being the clear leader, along with some interesting “skills” like humility and empathy. I weighed in with the competency research we worked on with the AICPA for the CPA Horizons 2025 Project. Leadership: The ability to develop and share insights and the aptitude to mobilize and inspire others to action. Leadership is about finding possibilities and developing people, utilizing their strengths, and shaping the future. Communications: Able to give and exchange information with meaningful context and appropriate delivery and interpersonal skills. It includes the ability to make thinking visible to others in a way they can easily grasp. Strategic thinking: A future-minded and flexible mindset that thinks critically and creatively. The ability to link data, knowledge and insights together to provide quality advice for strategic decision-making. Collaboration and synthesis: Being effective at engaging others and working across boundaries to turn challenges into opportunities, including the ability to consider the whole picture (past, present, and future context) and create alternatives and options for the future. Being tech savvy: Anticipating technology changes and how they can benefit others. Being adept at standardizing data for transparency, efficient exchange, and visualization. These competencies (a.k.a. KSAs — knowledge, skills, and abilities) are aligning with all of the research about skills that I have seen in the past year. The 2012 IBM GLobal CEO study identified the top skills wanted by global CEOs and highlighted four personal characteristics most critical for employees’ future success: being collaborative, communicative, creative and flexible. A CGMA study titled New Skills, Exisiting Talents listed information for insight, communication / collaboration, leadership, and strategic vision among the top skills for global finance executives. This shows the “wisdom of the crowd,” as the CPA Horizons 2025 Competencies were crowd-sourced from CPAs all over the United States. We put these skills in a framework we call The Bounce and show how the skills work across a career ladder and emphasize the importance of the key financial technical skills early in a CPA’s career. Interestingly, this follows Malcolm Gladwell’s “10,000-Hour Rule” from his book, Outliers, in which he claims the key to success in any field requires about 10,000 hours to master a body of knowledge. Applying this to The Bounce would show the first five years of a CPA career really working to master the critical accounting and financial body of knowledge. Then, at the manager position comes the turn and change of focus. It is this point at which the new skills like those listed above become critical. 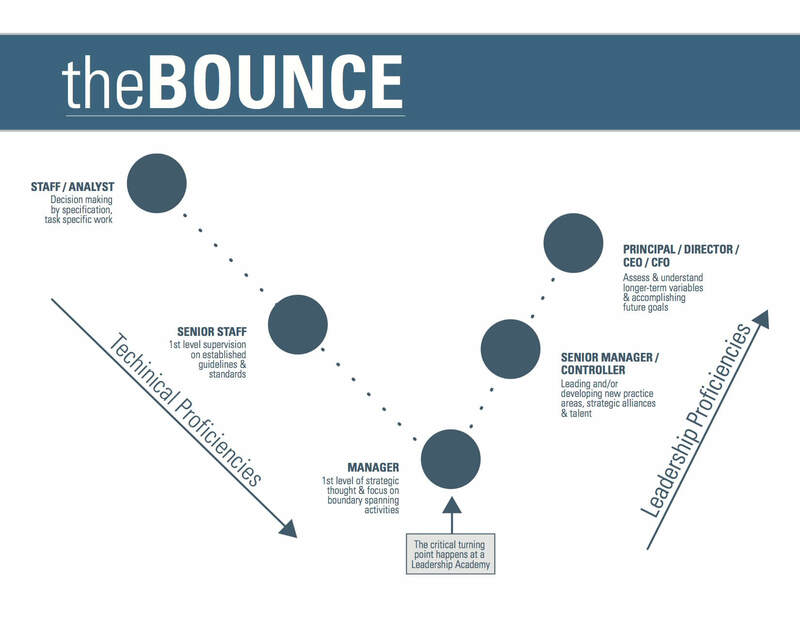 You can download our guide to The Bounce and the career framework here. and check out our Business Learining Institute’s catalog of #successkills for on-site and multiple format skills to bring to your office. What do you think the most important soft skill (we prefer “success skill”) is for CPA / finance leaders?